DaliPhone2 is a remote access version of DaliPhone, which is based on the P2P (Peer-to-Peer) technology. No re-configuration of the Wi-Fi router for port-forwarding and DDNS (Dynamic DNS) are required. DaliPhone2 is a downloadable application to be installed on the Android phone and Apple iPhone, and it can be purchased online by clicking the Play Store or App Store. 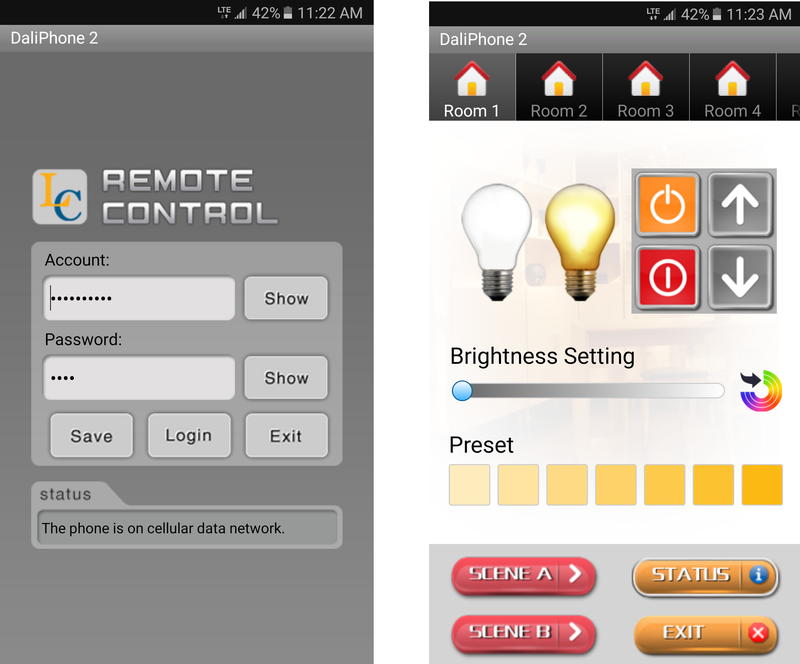 When the user is away from home and wants to control the luminaires or devices inside the house, DaliPhone2 can access DaliHub by using 4G LTE/3G/GSM mobile data network or public Wi-Fi hotspot. The entered account name and password are sent to the P2P server for authentication. If the credentials (account name and password) are verified, the user can then send command to DaliHub for controling the luminaires and devices. The account information can be obtained from accessing DaliConfig, which is a universally unique identifier came with DaliHub and cannot be changed. The password can also be viewed at DaliConfig, and it can be changed when necessary. For details, please refer to the user manual of DaliConfig. 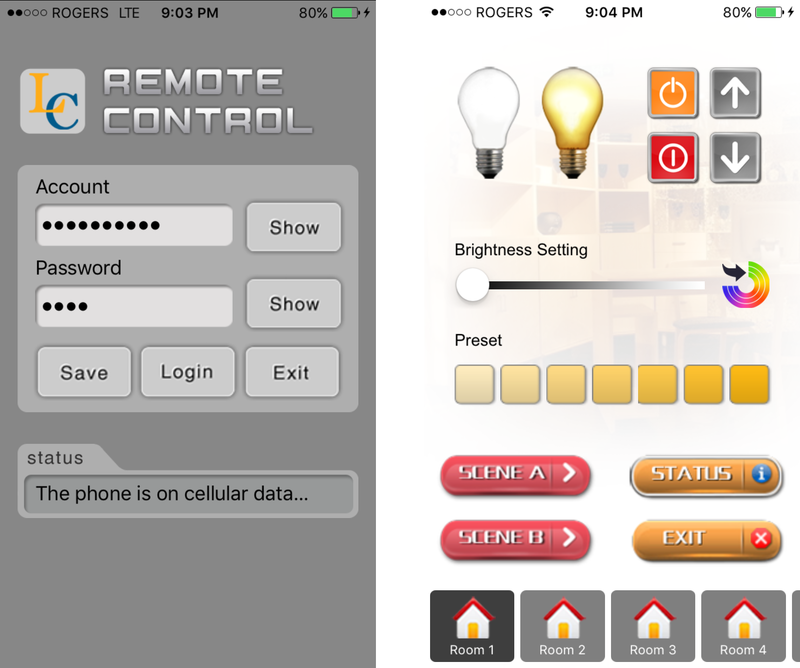 The graphical interface of DaliPhone2 is very similar to DaliPhone. The standard model is 5-room, and the default room names are Room 1, Room 2, Room 3, Room 4 and Room 5. The user can change the room name to suit his/her preference for easy recognition. Other room models are available upon request. 2) Each room has 3 individual groups each for luminarie, outlet and sunblind. 4) Slider bar adjusts light level from 0% to 100%. 6) 2 lighting scenes can be recalled. 7) Query the status level of group member. Port-forwarding - Also known as port mapping. It is an application of network address translation (NAT) that redirects a communication request from one address and port number combination to another while the packets are traversing a network gateway, such as a router or firewall. Dynamic DNS - a service to keep a domain name pointing to the same computer or server connected to the internet despite the fact that the address (IP address) of the computer keeps changing.